Home » Rail » Better Banks! The Environment Agency are responsible for the river bank stability at Railway Lane, Lewes and, recognising that the integrity of the existing blockwork facing was deteriorating, began to look into solutions to this challenge. As a result of the tidal inundation and drawdown cycles together with areas of groundwater seepages emanating from the slope profile, the problem was set to worsen if left untreated. The blockwork lines in our main picture show the slumping, bulging and lost integrity. The old block facing is removed and reused as riprap at the toe of the slope. The bank is regraded and dressed with a heavy duty needle-punched separation fabric. Work progresses on site during April 2013 as we lift our pre-filled Salix Rock Mattresses and position using their inbuilt straps. Sedimentation occurs as planned June 2013. The profile is unchanged and coping well with flooding and drawdown forces. By Mid June 2013 the tides are leaving sediments that are improving the visual impact and the first plant has colonised the rock matrix. The Salix Rock Mattresses are all butted up and mechanically stitched together with “hog rings” so as to form one continuous flexible revetment. The pore-water pressure from the profile can be released through the fabric and porous rock sheet. As the tides flood over the surface and retreat, so the engineered appearance will moderate with the accreting sediment that will lodge in the stone interstices. Along with this process will come the opportunity for colonisation by plants, adding biodiversity and landscape value. The work was completed on time and within budget. 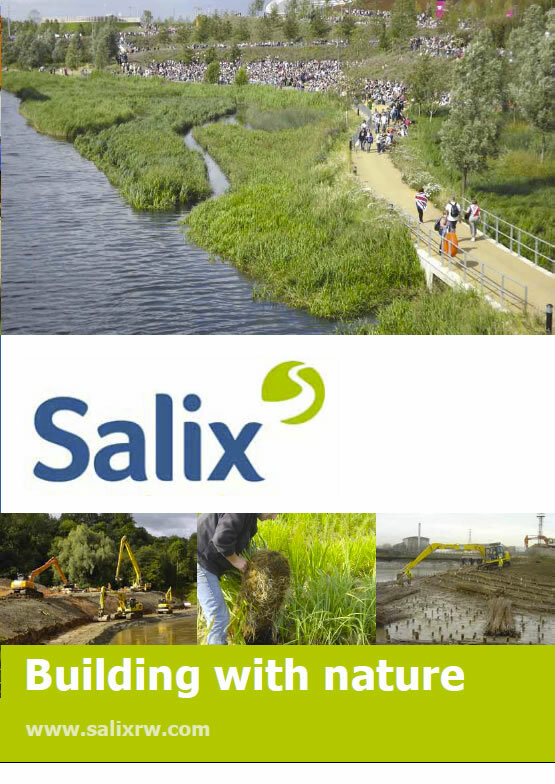 We will bring you an update on this project in later editions of Salix News as the plants develop.